CASE, Anthea. The Endangered Archives Programme after ten years In : From Dust to Digital : Ten Years of the Endangered Archives Programme [en ligne]. Cambridge : Open Book Publishers, 2015 (généré le 21 avril 2019). Disponible sur Internet : <http://books.openedition.org/obp/2213>. ISBN : 9782821876262. Case, Anthea. 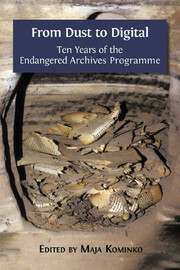 “The Endangered Archives Programme after ten years”. Kominko, Maja. From Dust to Digital : Ten Years of the Endangered Archives Programme. Cambridge : Open Book Publishers, 2015. (pp. XLIII-XLVI) Web. <http://books.openedition.org/obp/2213>. KOMINKO, Maja (dir.). From Dust to Digital : Ten Years of the Endangered Archives Programme. Nouvelle édition [en ligne]. Cambridge : Open Book Publishers, 2015 (généré le 21 avril 2019). Disponible sur Internet : <http://books.openedition.org/obp/2200>. ISBN : 9782821876262. Kominko, Maja, ed. From Dust to Digital : Ten Years of the Endangered Archives Programme. Cambridge : Open Book Publishers, 2015. Web. <http://books.openedition.org/obp/2200>.